This post by David Papkin is about Eva Air Premium Economy Class. 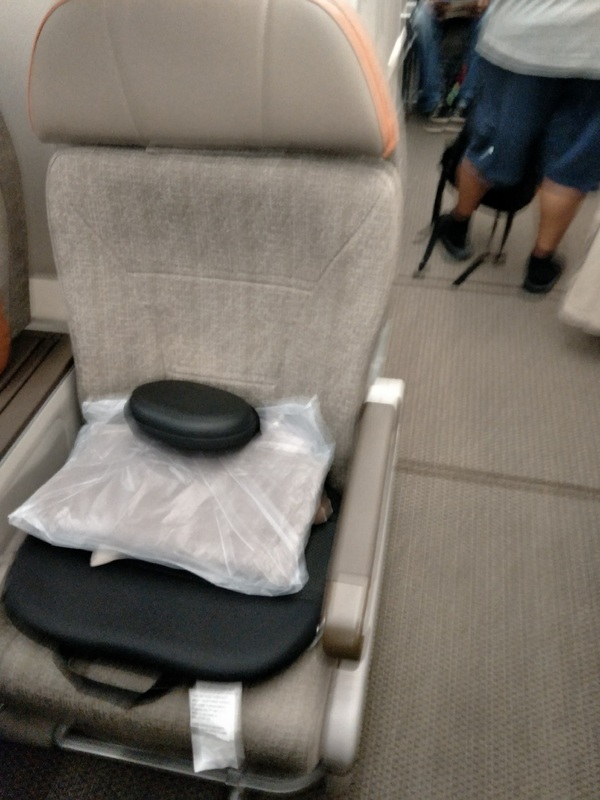 The Premium Economy Class on EVA Air’s B777-300ER aircrafts has extra space. 38 inch long, 19.5 inch wide seating space with ample leg room. The configuration of the Premium Economy is 2 seats, 4 seats and 2 seats. Ros 21 – 26 are dedicated for Premium Economy. Premium Economy has 2 dedicated bathrooms for seats 21 – 26, but you can still use the regular Economy bathrooms also. 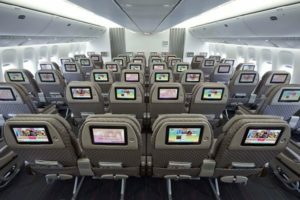 Inflight entertainment system features an 11 inch LCD touch screen that gives you access to Star Gallery’s extensive library of movies, TV shows, music and games, The movies were quite current, great for a long haul flight. You get a set of complimentary basic noise cancelling headphones. 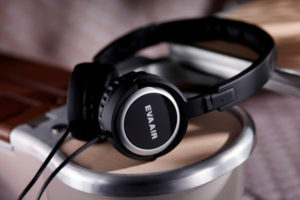 Much more comfortable than standard economy ear bud type found on most planes. 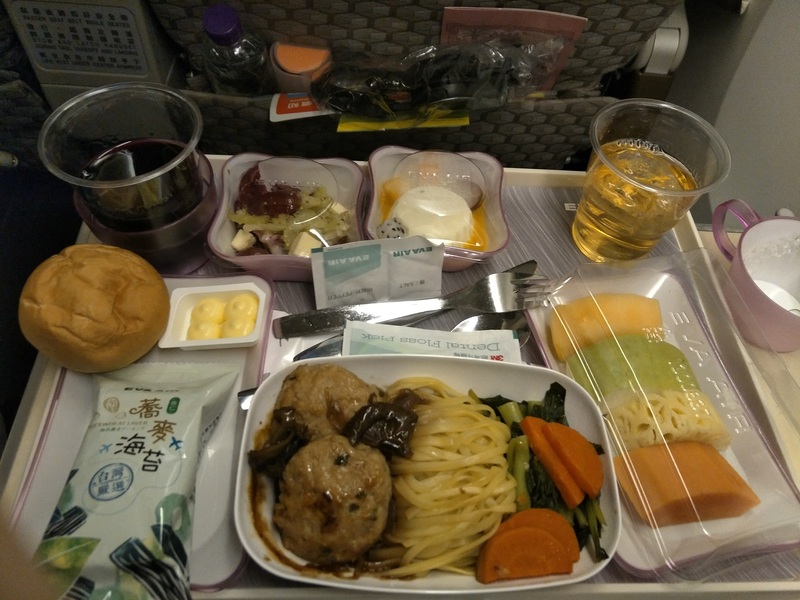 The food was quite good, I enjoyed the selection of food , snacks and beverages, including premium Plum Wine. I had Prok Meatballs with pasta and Plum Wine for my beverage. I tried the Wi-Fi on board There were seveal plans available, I picked the messaging only plan for 3.25 USD which should allow you 250+ messages on Whatsapp/’Line, Viber etc. Unfortunately, it cut out after after several minutes and I received an error message on my mobile phone about “Billing error, Please try again.” I entered my payment details again and managed to chat for severl more minutes and then was cut off again. I gave up after this time. When I checked my credit card bill after the flight, I found out I was double billed. I contacted Eva Air support about this and they were NOT helpful. They basically said my claim was inconsistent with the facts and refused to give any refund and insinuated that I was not truthful. They said I had used it for quite some time and worked perfectly and that I had purchased 2 wi-fi plans. Common sense would dictate that a person wouldn’t order 2 plans. The amount wasnt large, 3.25 USD x 2 charges. Not worth stressing about it, but I suggest you dont try it an give your credit card, they seem to be quite tight fisted in their service. Enjoy the flight, give your internet and fingers a rest! The staff was quite friendly, although some of the staff didnt speak English that well. Their staff is Taiwanese, Thai and Vietnamese. In conclusion, I recommend the premium Economy service Not much more than regular economy, but much more enjoyable. Also get more miles, as is K class usually. Eva Air is Star Alliance. 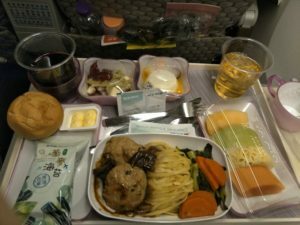 This concludes this post by David Papkin about Eva Air Premium Economy Class.